Thanksgiving is a time for family and traditions. When our family was transferred to Utah five years ago, we knew many of our traditions were going to change especially at the holiday time. We couldn’t travel for both holidays like we used to and as my mom usually made the Thanksgiving turkey, we were suddenly facing the prospect of cooking our own for the first time. That first Thanksgiving my best friend Erin flew out from California to celebrate the holidays with us. We went to the Trans-Siberian Orchestra concert in Salt Lake City, toured Antelope Island, and took a jaunt up to the Utah Olympic Park in Park City. As most of you know by now, my husband loves to grill. He would grill every day of the week if I let him and in just about any kind of weather (the exceptions being windy days or subzero temperatures – and yes before you ask he has tried). 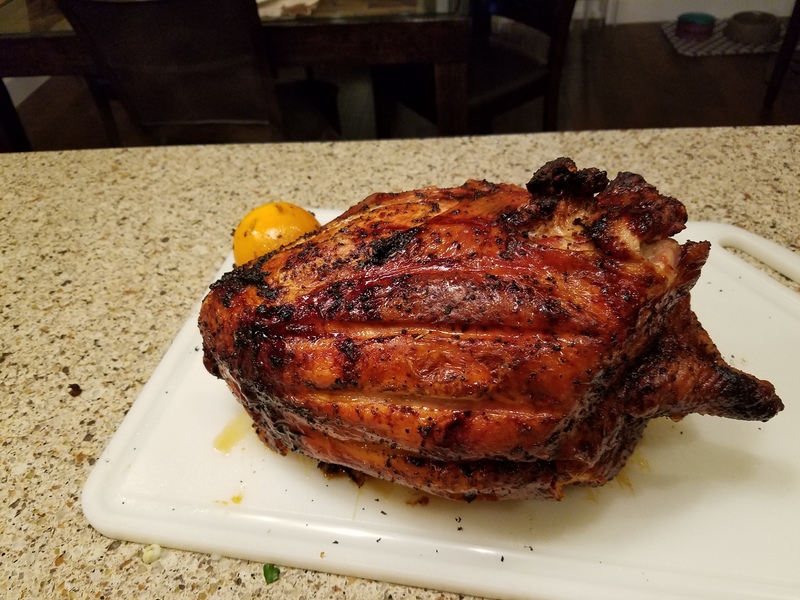 Steve found a recipe on the Weber website for Rotisserie Turkey. Not only did it sound delicious, it was easy, and he got to use his rotisserie attachment. Even now, five years later (and living near Seattle), it is our go to recipe for turkey. The recipe we use is fairly straightforward. Since neither of us like dark meat, we buy a turkey breast without legs or wings. The one we used this year was seven pounds and gave us more than enough for leftovers. To start, create a rub with granulated orange peel, dried sage, kosher salt, fresh ground pepper and about a tablespoon of olive oil. Remove the neck, giblets, and pop-up timer if included and discard (giblets can be used for dressing if you like). Rinse the turkey inside and out and pat dry with paper towels. Rub the entire turkey with the rub you created, being sure to get some under the skin where you can. Stud one to two small oranges, clementines, or mandarins with cloves, by making small incisions in the skin of the citrus and sticking cloves in the incisions. Use 6 to 10 cloves. Add a large bunch of fresh sage, six garlic cloves crushed, and the oranges to the cavity of the bird. Truss if necessary. Put the bird in your rotisserie attachment. Place on the grill over indirect heat, 2 ¼ – 2 ½ hours until the internal temperature reads 170 to 175 degrees in the thickest part of the turkey breast. Remove from the grill, tent loosely with foil about 20 minutes. Slice and serve! In a small bowl mix the rub ingredients. Remove and discard the neck, giblets, pop-up timer, and any excess fat from the turkey. Rinse the turkey, inside and out, under cold water and pat dry with paper towels. Prepare the grill for indirect cooking over medium heat (350º to 450ºF). Pierce each orange several times with a knife. Insert 6 whole cloves into each orange. Put the clove-studded oranges, garlic, and sage into the turkey cavity. Truss the turkey with butcher’s twine, tying the wings close to the body and securing the legs. Pin the skin flap to the body with two or three small trussing needles. Position one set of fork prongs on the far end of the spit and slide the spit into the neck end through the turkey (skewer the oranges) and out the other side, just underneath the drumsticks. Slide the other set of fork prongs on the spit and drive the prongs into the back of the turkey. Make sure the turkey is centered on the spit before tightening the fork prongs into place. Rub the entire exterior of the turkey with the rub, pressing it into the skin. Set the spit in place, turn on the rotisserie motor, and let the turkey rotate over indirect medium heat, with the lid closed, until the internal temperature reaches 170º to 175ºF in the thickest part of the thigh (not touching the bone), 2¼ to 2½ hours. Note: If you do not have a rotisserie, grill the turkey over indirect medium heat for 2¼ to 2½ hours. When the turkey is fully cooked, turn off the rotisserie motor and, wearing barbecue mitts, carefully transfer the spit from the grill to a cutting board. Loosely cover with aluminum foil and let rest for at least 20 minutes (the internal temperature will rise 5 to 10 degrees during this time). Remove the spit and discard the oranges, garlic, and sage. Carve the turkey and serve warm. This entry was posted in BBQ, Holiday, Rotisserie, Turkey.